If you make a company logo design and its corporate identity less than perfect; it will not give an inspiring impression to the beholder. A face is the index of mind likewise in the world of graphics what matters most is the very outlook of the design. The outer appearance counts a lot to form a strong impression on grass root level. The level of acceptance increases as per the creativity of the design. Who knows the upcoming company’s projects would fall upon you for your being a good designer of the first best designing work? 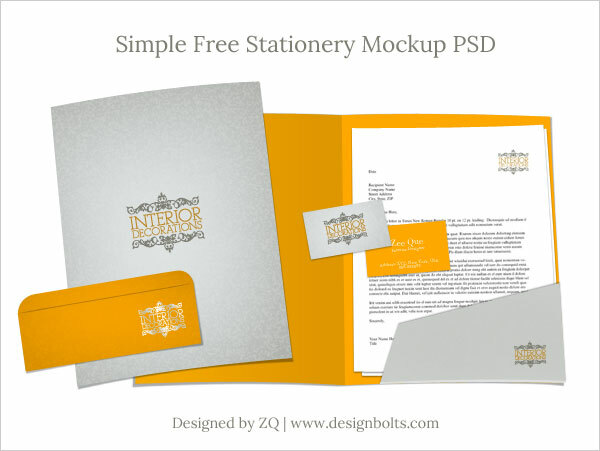 Today I am bringing before you free stationery mockup PSD – letterhead, business card, folder & envelop. In order to cast off the consequent hassle of redesigning, make the first impression be so unique that it would speak itself what does it stands for. Scroll down and have a look. Do subscribe us for more free vectors, free icons and other fresh graphic goodies.